What’s the use training Doctors on the Art of Seeing if in the real world we know they will be so beset by administrivia that they haven’t got the time to listen to Patients? 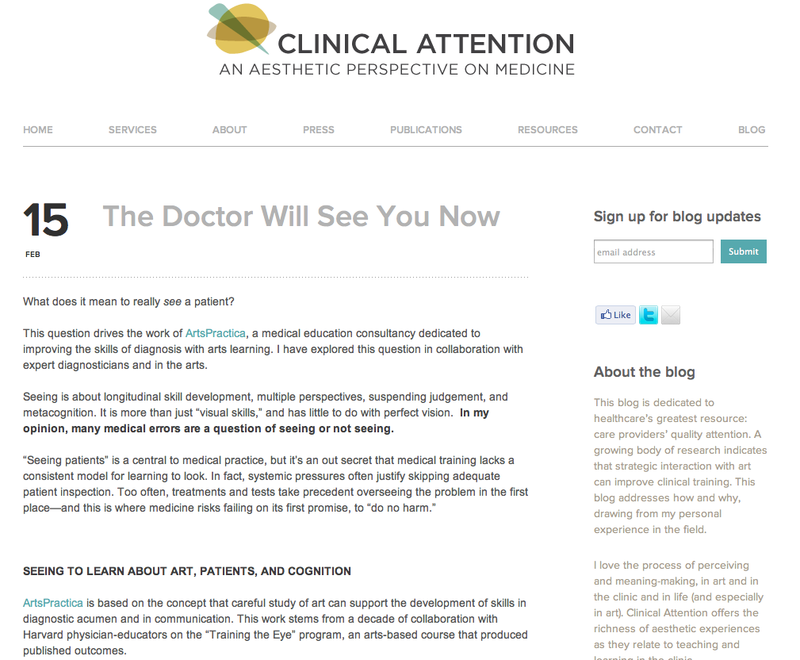 A fascinating article titled “The Doctor Will See You Now” by Alexa Miller at ArtsPractica asks “what does it mean to really see a patient?” and looks at an opinion that “it’s an out secret that medical training lacks a consistent model for learning to look“. I think the article itself acknowledges that the bigger real world problem is that “systemic pressures often justify skipping adequate patient inspection” and anyone who’s had a consultation with a Doctor who barely looked up from the computer or the keyboard they were pecking at doesn’t need evidence to appreciate this. Please don’t confuse the message in this post. I’m not for one second suggesting that Doctors shouldn’t have arts training and I personally don’t know any Doctors who haven’t got some art/music skills somewhere in their background – although that may well have something to do with the fact that the medical school I attended had an intensive interview program that was led by the most progressive admissions tutor in Europe. This post is about the lack of value we can get from prioritising the teaching of looking at patients when so little time is spent in clinical practice today actually listening to what patients want to say and so much clinician time is being wasted in documenting what patients do say at the expense of looking at the patients. Perhaps there would be more success with this approach if we shift the focus from looking to the patient as the piece of art to looking at their history as the subject? In reality I think the complexity of a patients needs make this far too simplistic an approach and this would be obvious even from just a data perspective eg. I could write a book about a single János Starker recital but I could fill a mainframe with information about an individual and still understand next to nothing. It’s also quite obvious to me that the vast majority of patients don’t actually look for a relationship with a Doctor where “no one is the expert“. Research showing how patients lack confidence in Doctors who use decision aid support tools highlights this. Fortunately almost universal access to the internet and tools that let patients effectively document their own history now means that the time and place for it to be “SAFE TO ASK” can be BEFORE we ever even get near to a patient. In primary care the evidence shows that the use of tools means that together with an existing Family Doctor relationship we can do most things without requiring the patient to visit the Doctors office but there will obviously be many times when this is required and I think it’s then when the value of having “fresh eyes” will have most impact because they will be supplemented by fresh ears that will have already effectively listened to all the patients concerns in a way that is without judgement or time pressures, fresh fingers (because they won’t have had to peck around at a keyboard to document it all) and a fresh mind because they will have all the important questions already asked and documented so they can focus on working with their patient on the pertinent issues. Where would I go now with this research? In the Google Hangout video I find myself in complete agreement with Alexa Miller in that “misdiagnosis rarely happens as a result of faulty knowledge it’s almost always a case of faulty data gathering and faulty data synthesis” but we diverge on our approaches to the way we fix this problem eg. Alexa Miller suggests that we need to give “care providers more practice in these skills” so that they “can develop the skills to seek a second opinion” whereas I think we can select people who have already practiced these skills in the admission process for medical school and there is an abundance of evidence that shows we are at a point in time when we have opportunities to let patients help us with the data challenge and can now automate and deskill the very best and most experienced history taking and data input tasks so that we can focus on making the most accurate first opinion by knowing about the needs before the consult room door ever swings open. Imagine if we took the time we currently use teaching and examining Doctors on how they take a history and assumed that in their entire career there would always be an electronic device that could enable a patient (or carer) to do this for themselves. Cut all that rote learning out of the medical syllabus and instead use the time to train Doctors on the art of providing documented consultations and instead of focusing on a role as gatekeeper to a second opinion we work to ensure that we can send patients to the most appropriately talented professional first time every time.